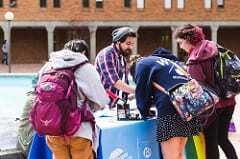 Clubs and organizations at Western provide great ways for students, staff, and faculty to build community, find support and resources, and have fun. Out In Science is a group of STEM students and faculty working for the promotion and inclusion of queer people in the STEM community. 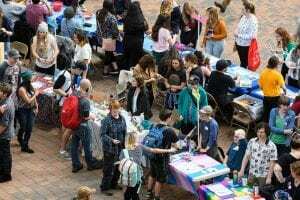 Queer Club is dedicated to bringing LGBTQIA+ students together to educate and discuss queer topics as well as to create a social space for the queer community on campus. QueerCon is a planning committee for our annual convention (QueerCon) promoting queer representation in media. The Queer Resource Center (QRC) provides programs, welcoming space, and resources to students who identify as queer and their allies. The QRC does this by reaching out and building community among Western students of diverse backgrounds, advocating for and educating about queer identities through events and resources, creating and affirming positive self-identities, networking with queer clubs, providing peer counseling services, and addressing current issues relevant to the Queer community. QTPOC (Queer and Trans People of Color) is an Ethnic Student Center club supporting queer and trans students who are people of color. Check the ESC’s club listings for more information about QTPOC. The Queer Writers Club aims to create a safer space that supports the use of writing as a form of empowerment for the queer community and other marginalized groups. TAG is an open social space for transgender and gender non-conforming students and community members, and people of any gender identity are welcome. TAG is a casual social group that meets weekly to relax in an environment with people who can understand and share similar experiences. Western Aces is intended to provide a safe, inclusive space for those on the asexual spectrum as well as those who support asexual rights and social movements. The club’s goal is to provide support and understanding to fellow Aces through community engagement and visibility. Gaymers is a social group of queer and LGBTQ+ gamers who discuss games, queerness, life, and just hang out. The club also helps students find others to play games with, including computer games and tabletops. Queer Christian Club (QCC) creates a space for the LGBTQIA+ community on campus to explore their faith in a judgment-free zone, to create opportunities for members to meet other Christian/faith-questioning people (be they allies or members of the LGBTQIA+ community) as well as to connect with the community of Western as a whole to educate and connect over LGBTQIA+ issues and identity. Blue Group is a support group for undocumented students, community, and allies. For the past two years, Blue Group has brought UndocuQueer guest speakers to share about their experiences as first generation, LGBTQ+ persons of color, undocumented students and much more. The purpose of the Lesbian, Gay, Bisexual, Transgender Advocacy Council is to ensure that LGBT people and issues matter at Western and in the larger community. The Council provides support, advocacy, and resources for the students, staff and faculty of Western Washington University.